OK. 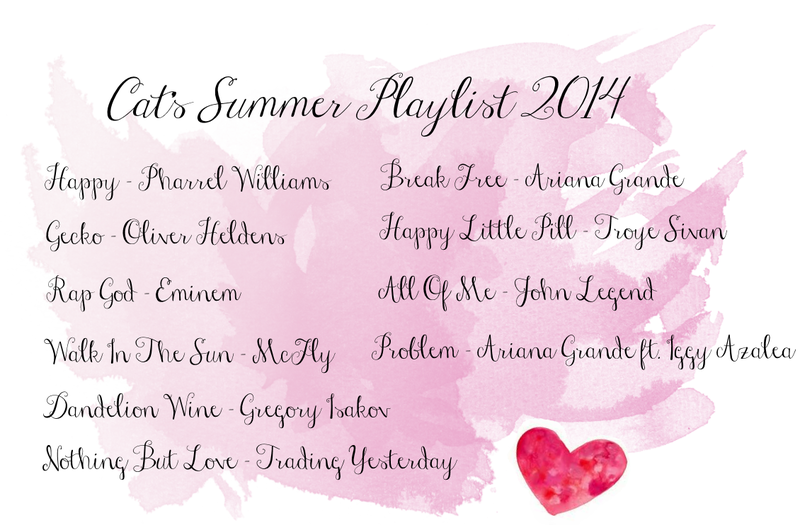 So my summer playlist will slightly look like this weeks Top 10 with a few favourites thrown in, but I thought I would do this post anyway since I love my music and am very much enjoying it at the moment. I kinda 'forgot' to get myself prepared for photographing my next few planned in blog posts, and the daylight was gone to take any decent photos so I didn't quite know what to do, but knew I wanted to blog! I spent most of my afternoon shopping with my aunt and metephorically dying from my super-hard work out, which kept me pretty busy. I'm doing a 28 day teatox which I will be posting about weekly... first post to come Thursday! Anyways- lucky for me, I have a notebook full of blog post ideas, noticed I hadn't done this one yet and...Voila! As you can see, I made a little YouTube playlist with these songs plus a few more I forgot about that I'm really enjoying this summer. From chart hits and new tunes, chilled out songs and country music... I honestly don't have a favourite genre - I just like music! Enjoy! I love problem, it's such a feel good song. Iggy Azalea's album is worth a look too, really, really good. oooh i love all of these!! i've also been listening to a lot of george ezra - he's great!